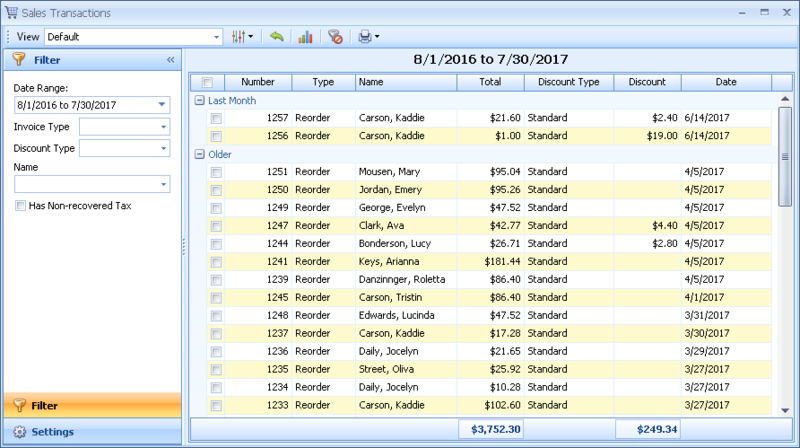 The Sales Transaction form allows you to view and print your sales information in various formats. 5 different views can be accessed from the View drop down. Additional views can also be loaded by clicking and selecting Load View. Select a desired view from the View drop down. 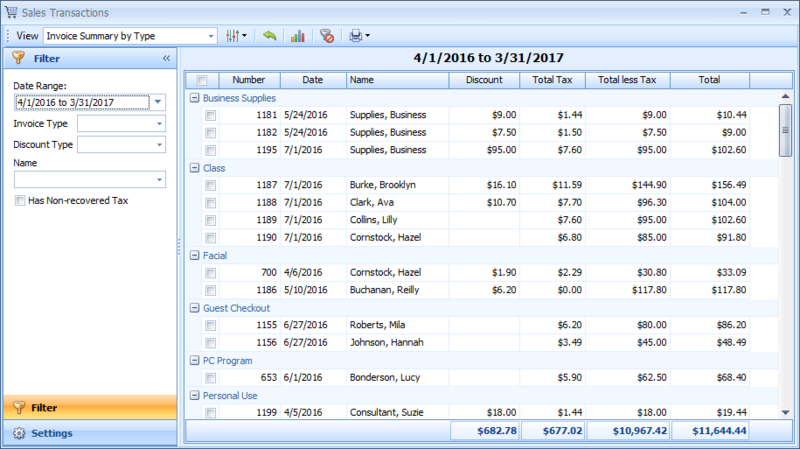 From the Filter side bar, under the Date Range field, select one of the quick date options, or choose Custom to enter a custom date. For further refinement, select an Invoice Type, Discount Type, Has Non-recovered Tax or Name. To print as a report, click and choose either Print or Preview. Alternatively, to print individual invoices, click next to each transaction, then click and choose either Print or Preview (The Deliveries view will not print individual invoices, but instead allow you to select the deliveries you will be making to be printed in a report format). To add additional fields to the view, click and select Column Chooser. Drag and drop desired fields onto the current view. To hide any columns, right-click on the column header and select Hide This Column. To sort by a specific column, click on the column header to be sorted by. To filter by a specific column, hover over the column header. Click on and choose your filter criteria. To clear all filters set, click .